lt;stronggt;RCPE138lt;/stronggt;lt;BR/gt;Rubbermaid Universal Headband Mop Headlt;BR/gt;Assign a universal-design mop head to either floor-finishing or general wet-mopping tasks amp;quot; it does both equally well. Looped-ends minimize the potential for linting and de-plying. Headband accommodates both side-gate and clamp-style handles. 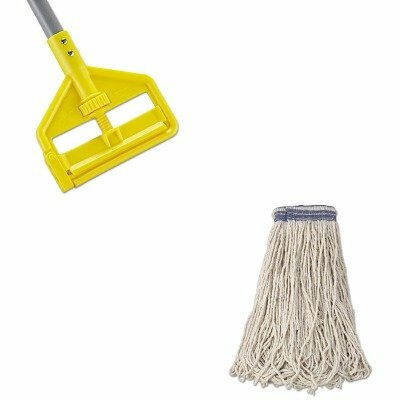 Head Type: Wet Mop Application: Floor Maintenance Mop Head Style: Looped End Mop Head Size: 24 oz.lt;BR/gt;lt;BR/gt;lt;stronggt;RCPH146lt;/stronggt;lt;BR/gt;Rubbermaid Universal Headband Mop Headlt;BR/gt;Easy-change, side-gate design allows you to quickly slide mop heads on or off. Adjustable thumb wheel enables stress-free, tight and secure clamp down. Solvent- and acid-resistant frame enables use with all commercial floor stripping agents. Handle Length: 60amp;quot; Handle Diameter: 1amp;quot; Handle Material: Fiberglass.